Send/Receive data with other iphone. Difference Lite and Pro. And how to get Pro. 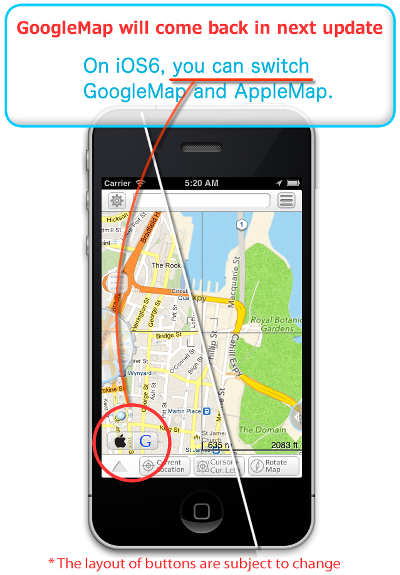 21 Sep : Google map will come back on iOS6 in next update(ver1.8). Ver 1.8 will be released on or around 3rd Oct. This is an alternative to the standard maps app on iphone. As you can guess from the name, this project was started to improve the disappointing aspect of MyMap functions on GoogleMap. "I want to mark on maps, besides simply." It is a general request, but the GoogleMyMap is still better than any other map apps. However, in order to manage numerous markers, GoogleMyMap feature should not be enough. that is the best combination of map app. - Jogdial smooth zooming map. - Import data from GoogleMyMap. - Street view + Pegman. - Corresponds to Map rotation any time. when displayed street view, direction route, a lot of markers. - One tap direction search. Just move map and tap route button. Can be used as car navigation systems. - Easy to use map (loacl) search. - Full map editing. and refined UI to make it easier to edit map on the iPhone. - Easy to use the marker list. There is no need to move to another screen. - Easily import map data that created by other users.